Few birds in nature are as beautiful and colorful as the Rosellas. They are very popular with aviculturists because of their striking colors and their relative quietness compared to other parrot species. Several species are widely kept as pets. 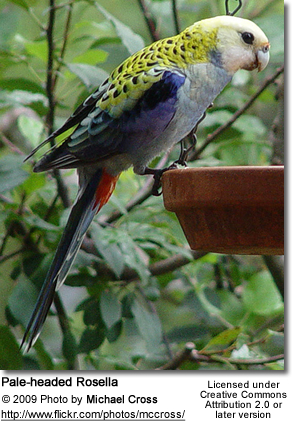 Legend has it that early settlers first encountered the Eastern Rosella at Rose Hill, now a Sydney suburb. They referred to it as a "Rose Hiller", which eventually became "rosella". There is also a second story that the name is derived from 'Rosetta', the first name of the wife of George Fife Angas, a settler in Australia, but he forgot to cross his T's (leaving them appearing as lowercase L's), hence "rosella". 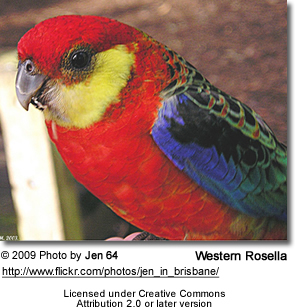 A rosella is one of six species of Australian parrots in the genus Platycercus. 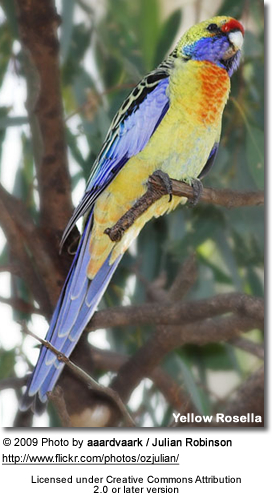 Platycercus means "broad-" or "flat-tailed", reflecting a feature common to the rosellas and other members of the broad-tailed parrot subfamily. Rosellas are native to Australia and some nearby islands, where they inhabit forests, woodlands, farmlands, and suburban parks and gardens. They are confined to the coastal mountains and plains and are absent from the outback. Introduced populations have also established themselves in New Zealand and Norfolk Island. 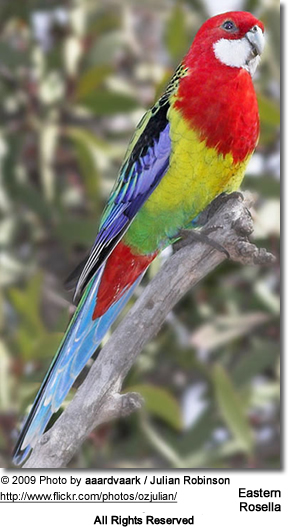 Rosellas range in size from 25-38 cm (9.8-15 in) and adults are generally very colorful. Immature birds are typically duller, and attain the adult coloration after their second molt - when they are about 12 to 16 months old. At that time they also become sexually mature.